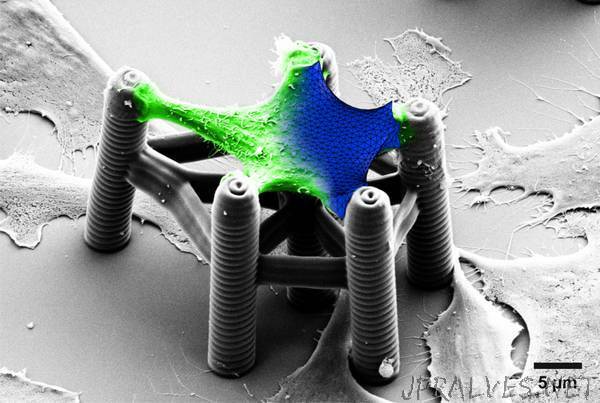 Additive processes, such as 3D printing, can be used to produce nearly any structure, even in the nanoscale. Depending on the “ink” applied, the structures produced fulfill various functions: from hybrid optical chips to bioscaffolds for cell tissue. Within the Cluster of Excellence “3D Matter Made to Order,” researchers of Karlsruhe Institute of Technology (KIT) and the University of Heidelberg plan to raise three-dimensional additive manufacture to the next level. The goal is to develop new technologies for flexible, digital printing of structures from the molecular to the macroscopic scale. “This will only be possible with new inks and photoresists developed by chemists. For application in biology, for instance, we need materials that are degradable under physiological conditions at the push of the button, so to speak. And we need conductive materials that can be printed in three dimensions with nanometer precision,” says Uwe Bunz, Professor of Organic Chemistry at Heidelberg University, member of the Centre for Advanced Materials (CAM; www.cam.uni-heidelberg.de External Link) there and spokesman of 3DMM2O. They are to be finer, faster, and more diverse: additive processes and technologies enabling applications in materials research and life sciences. To reach this goal, natural scientists and engineers work along three interconnected lines: in the area of “Technologies,” novel tools will be developed to produce structures down to 10 nm. The new tools are to enable faster and more precise printing with different inks and photoresists developed in the area of “Molecular Materials.” Customized artificial materials are to have a wide spectrum of properties and can be combined. The area of “Applications” will cover applied research. Here, the focus lies on optics and photonics, materials sciences, and life sciences. The printed 3D structures are to improve the performance of optical chips in information processing or to be used in artificial retinas. A central element of the cluster is the HEiKA Graduate School “Functional Materials.” HEiKA stands for the Heidelberg Karlsruhe Strategic Partnership that covers all joint bilateral activities of KIT and Heidelberg University. The Graduate School integrates master’s and doctoral students into the highly interdisciplinary research area. Here, a broad module program plays an important role. Every year, Carl Zeiss Foundation will fund up to four master students who intend to gain a doctorate in the area of 3DMM2O. In addition, the Foundation will support up to 20 doctoral students writing their theses in the areas covered by the cluster. Researchers of KIT and Carl Zeiss AG have developed a system for additive manufacture of multi-colored, fluorescent security features in three dimensions. These can be used to protect banknotes, passports, and branded products against counterfeiting. The basis is 3D laser lithography, in which a laser beam is passed through a liquid photoresist and hardens the material at the focal point of the laser beam only. Scientists integrated a self-developed microfluidic chamber into the lithography device for printing with a variety of materials. Now, a single device can print three-dimensional micro- and nanostructures from several materials in a single process step. Direct laser writing can be used today already to produce precise structures on the microscale. For many applications in biomedicine, however, it would be advantageous if the printed objects were not rigid but movable systems that can be switched after 3D printing. Researchers of KIT have now been able to produce three-dimensional structures from hydrogels that change shape under the influence of temperature or light. The 3D structures produced in this way are functional in aqueous environments and thus ideal for applications in biology and biomedicine.